Ready for 2014, Padre fans? 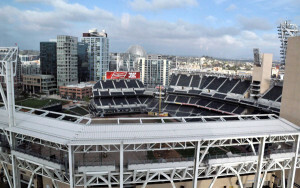 Whether the team has a chance in the National League’s Western Division or not, the San Diego Padres management has outlined some nifty new features at Petco Park as the team celebrates its 10th year in its downtown home. The Padres are hosting Opening Night Sunday against the Los Angeles Dodgers, in a sold-out 5 p.m. game that is being broadcast on ESPN. The late Jerry Coleman, a long-time Padre broadcaster, will be saluted, and there will be a celebration of the military. Tickets remain available for the rest of the series, which resumes at 3:40 p.m. Tuesday, with Opening Day. New noshes are available at the Western Metal Supply Building, where Rimel’s Rotisserie will be on the roof. On the main concourse, Cardiff Seaside Market will open and Phil’s BBQ will add a second ballpark location. Want more local craft beer? 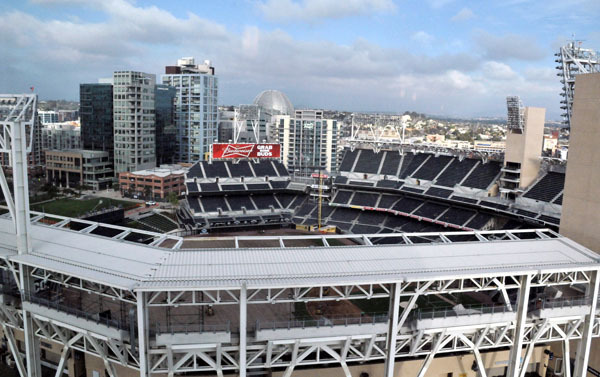 Stone Brewing Co. adds a rooftop beer garden on the upper deck, while Ballast Point Brewery will be on the garden level on the first-base side. There will be enhanced audio and video, including a video screen at Park in the Park that is 50-percent larger than last year and in high definition. Fans also can also obtain better WiFi access with a Digital Membership or through MLB’s At the Ballpark app. This one’s more subtle, but hey, look at the floors on the main concourse, terrace, garden and part of the upper deck. Brand, spanking new, so enjoy them before all the fans traipse all over them!